Department of Art | "Big Relief: Large Scale Woodcuts from Print Media Workshop"
Home » News » "Big Relief: Large Scale Woodcuts from Print Media Workshop"
"Big Relief: Large Scale Woodcuts from Print Media Workshop"
Amy Fleming announces the upcoming exhibition of work from the Fall 2012 relief class, ”Big Relief: Large Scale Woodcuts from Print Media Workshop”. The exhibition features wheatpasted woodcuts carved from 4-foot by 4-foot plates, and is the culmination of a semester-long project. 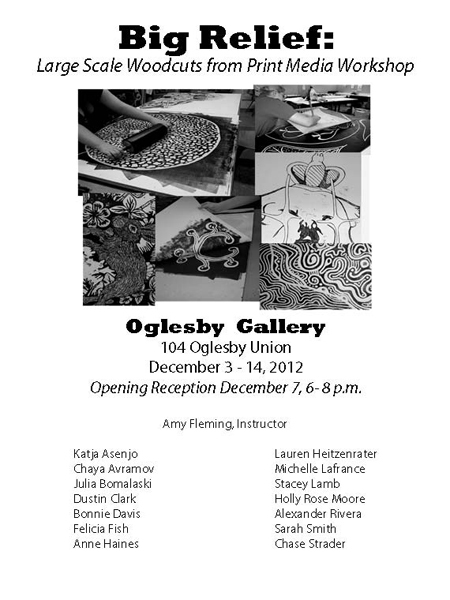 ”Big Relief” is at the Oglesby Gallery from December 3- 14, with an opening reception on First Friday, December 7 from 6 – 8 p.m.